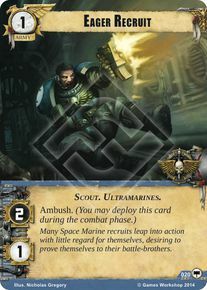 Many Space Marine recruits leap into action with little regard for themselves, desiring to prove themselves to their battle-brothers. This card wins battles. Simple as that. Unit removal that gets to stick around is the best kind of removal. 5/5. Simply 2 damage for 1 resource. Or a deserted first planet win for a resource. Sadly no command.